Rubber Room Ramblings: I LOVE MAIL! I love to get mail, especially when it is a handmade card! This past week I received a couple of Christmas cards made by some of my very talented customers, and I really want to share them with you! I hope you will enjoy them as much as I am. This one was made by Brenda. She really has that cardinal down pat. 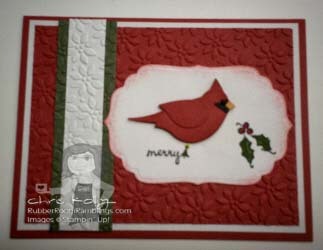 It is a beautiful card with the Two-Step Bird Punch and the Petals-A-Plenty embossing folder for the Big Shot. Thanks so much, Brenda, for sharing your beautiful card with me at Christmas! Love it!!! What a great card to receive!